ItemI-52658 - "Land clearing, tractor pulling stumps near Prince George"
ItemI-52659 - "Dog team at Goat Pass, the summit of the Ground-hog Range, Cassiar Division". ItemI-52660 - "Land ready for stumping operations near Prince George; logged-off land"
ItemI-52661 - "The start of a survey party from Taylor's ranch". ItemI-52502 - "East Kootenay Power Co. diversion dam on the Bull River". ItemI-52271 - "McIntyre dam and intake", No. 2. ItemI-52518 - "A slab of granite near the Waddington Trail, from photo by Schnarr, trapper and guide". Item I-52502 - "East Kootenay Power Co. diversion dam on the Bull River". 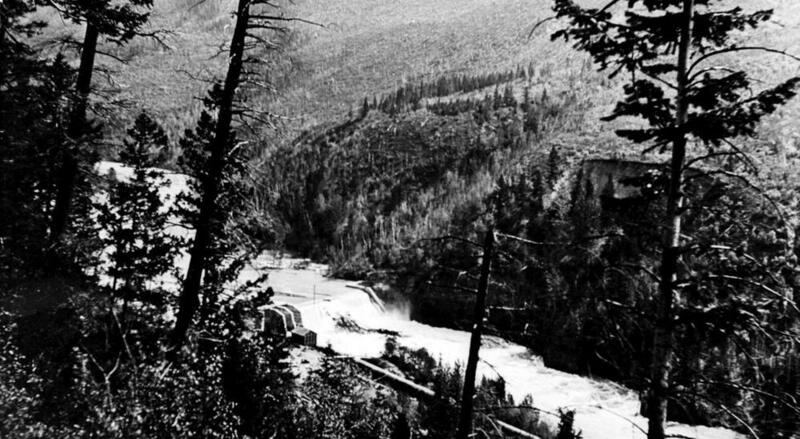 "East Kootenay Power Co. diversion dam on the Bull River".